It is important to note that no records have been found to date which indicate when Tilsy Barn was actually constructed. 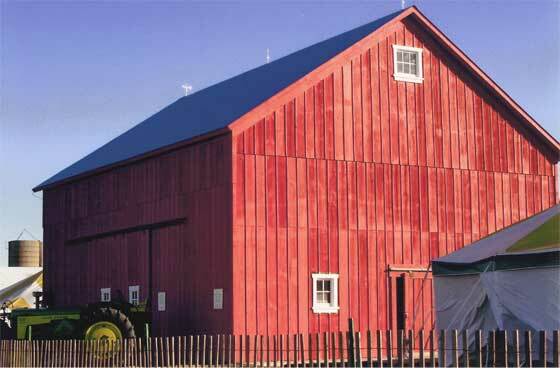 The barn itself has many features that were indicative of 19th century barn construction. In the 1850 census, Peter Marshall was listed as the owner of the farm we now call Tilsy Farm. William Tilsy came to the U.S. from Germany shortly after his marriage in 1857. He probably acquired the Marshall farm between 1860 and 1862. The farm remained in the Tilsy family until the 1980s. It seems that the farmhouse was originally located on the east side of Bell Road where the other farm buildings were. Later the land on the west side was acquired and another farmhouse was built there. The barn remained a prominent structure due to its placement on the top of the hill on South Bell Road and so close to the road itself. The Forest Preserve District of Will County purchased the land on the east side of South Bell Road and began development of Homer Trail Preserve. The barn remained in its original location from its construction sometime between 1870 and 1880 until it was meticulously taken apart and moved in2010 to the Konow Farm on Cedar Road in Homer Township. It now sits in a prominent position again and worthy of its designation as an Official Will County Landmark.